Following our well-attended first party at Loves Co. in Shoreditch in November we’re pleased to be back for a series of parties for 2015. The venue is the perfect space for us situated in a cool basement and low ceilings in the heart of Shoreditch, all the right ingredients and the right setting for dance and expression. Residents Matt L-S and Jamesey continue to lead the way in the London soulful/deep house scene always taking the crowd on a journey through the latest underground house sounds. Look out for forthcoming exciting projects on their label from artists such as Sheldon ‘So’ Goode, Neal Conway, Miranda Nicole and a hot EP from Steal Vybe all dropping before Spring. Dont forget you can catch the guys every Saturday night spinning live on HouseFm.net from 6pm. Our special guest for this event is Luis Radio. Luis has been a fundamental part of Italy’s house scene over the years holding residencies at famous clubs such as Room26, which has the best sound system in the world. He also is a fantastic producer having worked with labels such as Seasons Recordings, Tony Records and Wonderwax and has an exciting EP release ‘Wurly’s World’ EP dropping on the Makin’ moves label in March so definitely look out for that! Baltimore singer, songwriter Dana Weaver makes a welcome return to the Makin’ Moves label fresh and on a high following her hit ‘My Freedom’ with producers Souldynamic which recently hit number one on the Soulful Traxsource Top Ten chart! Dana first appeared with Phatfrank on our fourth release on the label ‘Hot’ which was a firm favourite at the Winter Music Conference in Miami in 2013 and looks like 2015 could be a very big year for this talented lady. Here she returns with Neal Conway on production duties, Neal also hails from Baltimore the home of many influential soulful house producers. He started out DJing under the guidance of his mentor Thommy Davis (Basement Boy Music). From there, Thommy brought Neal into the Basement Boy family and was the member behind a number of early Original Basement Boy Production hits! Neal brings a fantastic uptempo soulful groove to his version and will certain warm up many a dance floor during these cold winter months! This release also features hot remixes from Brooklyn’s DJ Spinna who brings a real and bounce and energy to his mixes, already these have been a firm favourite with the likes of Louie Vega and Danny Krivit. This release will be available as an exclusive promo from Traxsource.com on Monday 2nd March, full release on other digital stores from Monday 30th 2015. A native of Newark, NJ Sheldon Goode is a multi-instrumentalist, singer, songwriter, producer and engineer….whew!!! He’s a one man show when it comes to the recording process. Sheldon has worked with Elton John, Whitney Houston, Patti Labelle, Naughty By Nature, Lords of The Underground, Donell Jones and a long list of the who’s who in the music biz. Soooooooooo Sit back relax and enter the musical world of Sheldon”So”Goode. Neal Conway is a world-renowned Producer/Songwriter/DJ/Remixer. Neal has been on the music scene since the late 80’s. He started out DJing under the guidance of his mentor Thommy Davis (Basement Boy Music). From there, Thommy brought Neal into the Basement Boy family. During his stint with the Basement Boys, he has cranked out hits like Gypsy Woman (She’s Homeless-Gold Record), Makin’ Happy, Surprise-Platinum Album (Crystal Waters), Scandal, Rejoicing (Ultra Nate’), Tonite (Those Guys) and many others. Neal was the man behind a number of early or the Original Basement Boy Production hits!!! More recently, Neal co-wrote a Double platinum selling hit for Rapper T.I. named “Why You Wanna”. Not only Neal received a triple platinum album, but he also received an award for having one of the top ASCAP (American Society of Composers, Authors and Publishers) songs for 2007. WALKING-Mary Mary (SOUL TRAIN MUSIC AWARD for BEST GOSPEL PERFORMANCE & 2012 ASCAP Music Awards for GOSPEL & for R&B), TOOK MY LOVE by Pitbull (2012 Ms. America Pageant Theme Song) and Currently Working its way up the up the Global Charts….Going Out by A.P.L. of the Black Eye Peas. Finally, since 1988, Neal has an extensive resume as a DJ in the clubs as well as radio. Neal has played in clubs from New York (The Sound Factory Bar) to Miami (The Club Warsaw) to Televiv, Israel (Club Shoken) to London (The Ministry of Sound) to Baltimore (Club Fantasy,The Paradox & Club Sugar). Neal has blessed the airwaves with his mixes. He has mixed on stations such as: WEAA 88.9fm, (92q) WERQ 92.3fm, Magic 95.9fm (WWIN), 1300 WEBBam, 98.7 WKYS FM (New York), WBLS 107.5 (New York), http://cyberjamz.com & http://housestationradio.com (Italian Internet Radio). Neal has also toured with such artists as; Roy Ayers, Melba Moore, Vaughn Mason and many others He has also done a number of remixes for people such as: Michael Jackson, Whitney Houston, Jill Scott, Erykah Badu, Steppenwolf, The Jacksons, Musiq Soulchild, India Arie, Jaguar Wright and many others. Makin Moves are proud to welcome yet another new exciting artist to the label, Sheldon ‘So’ Goode from New Jersey. ‘Where U R’ surfaced last year on Wali B Entertainment, the label that Sheldon is signed to in his native New Jersey. Mark Francis from Shelter in New York took a strong liking to the track with the awesome hook and along with his studio partner Adam Rios (who works with Shelter’s head honcho Timmy Regisford) asked permission to remix the track. Mark kindly sent us their remix version and we immediately feel in love it and the rest they say is history! This new mix goes under Mark and Adams new production guise ‘Quality Control’. Already a firm favourite with the likes of Louie Vega and Joe Claussell this release will be available as an exclusive promo from Traxsource.com on Tues 20th January, full release on other digital stores from Tuesday 17th February. 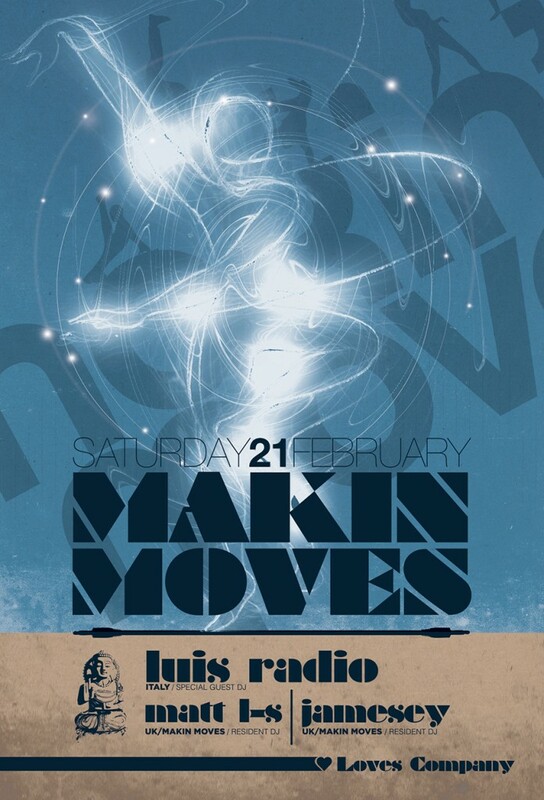 Makin’ Moves kick off 2015 with a very exciting event at Prince of Wales in Brixton across two rooms featuring two global house music icons Ralf Gum from Gogo Music in South Africa and Monique Bingham from New York both having worked together on some classic tracks of their own.. This event will feature a special guest dj performance from Ralf Gum, his first appearance in London for over a year. Ralf currently resides in South Africa and is one of the busiest working djs and producers on the scene out there running his very successful Gogo Music label. Ralf’s recent album ‘In My City’ has been flying out and features such artists as Hugh Masekela, Jocelyn Mathieu, Kafele Bandele, Portia Monique, Monique Bingham. The album was rated as Best Dance Of Album of 2014 by Itunes SA! Also, performing at this special event will be Monique Bingham. Monique is one of the most popular artists on the soulful house scene and has sung on numerous successful hits across the last 15 years. She and Ralf have collbarated on many successful hits over the years including ‘Take Me To Your Love’ the and excellent new ‘The Pap’, both of which Monique will be performing on the night! Im room two we feature some of London’s finest dj talent in the form of dj soulprovyder from 4 to the floor, David Bailey and House FM’s Ted Lawrence. It all looks set for one of the events of the year and we advise to grab your tickets early as this will certainly be a roadblock! Makin’ Moves kick off 2015 with freshly cooked remixes of their hit from last summer ‘Hot’ featuring Baltimore sensation Dana Weaver on vocals. This time the package comes from Underground Collective main man Marlon D currently residing in Columbia and Baltimore’s N’Dinga Gaba. Dana recently performed on Souldynamic’s ‘No Fear’ EP on Unquantize and alongside Neal Conway, also from Baltimore, look out for her new single ‘Fading Away’ coming soon on Makin’ Moves with remixes from DJ Spinna. Full release Tuesday 29th December 2014.